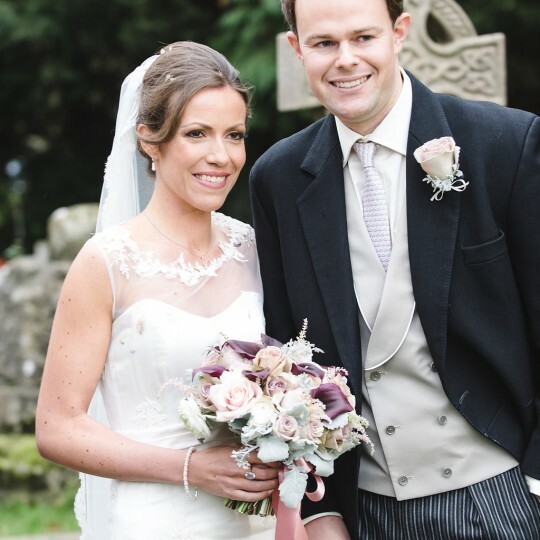 Tara and Mike's romantic outdoor wedding, Buckinghamshire - Joanna Carter Wedding Flowers | Oxford, Oxfordshire, Berkshire, Buckinghamshire and London. The british weather is sufficiently unpredictable that not all our brides and grooms are lucky enough to have the outdoor wedding ceremony or reception that they would like. Tara and Mike could not have been more lucky though with the stunning sun filled July day of their wedding. They took full advantage of the brilliant weather for their gorgeous outdoor wedding reception. The result was probably the most romantic setting of any reception we have ever worked on. It was all expertly captured by Cat Hepple (www.cathepplephotography.com) who has really caught the lovely essence of the day. 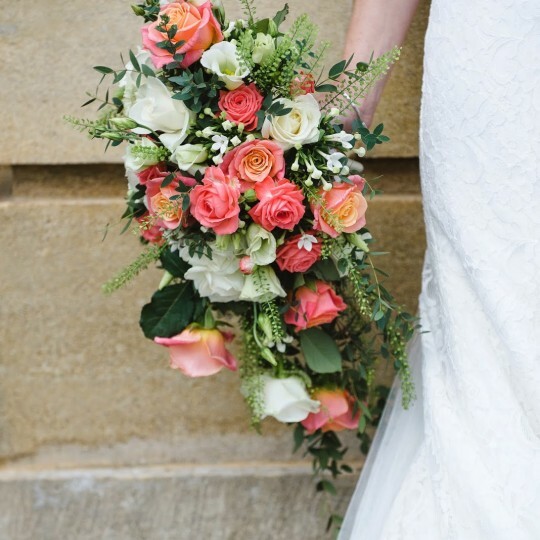 The palette of flowers that Tara chose, equally romantic, with soft peach talea roses, pale green and ivory hydrangeas, soft peach stocks, astilbe, thlaspi, hypericum and scabious amongst the flowers we used. Tara was a stunning bride despite the healthy competition from her stunning daughter who was a gorgeous flower girl! Tara also had three adult bridesmaids who carried bouquets of pale peach talea roses and astilbe. 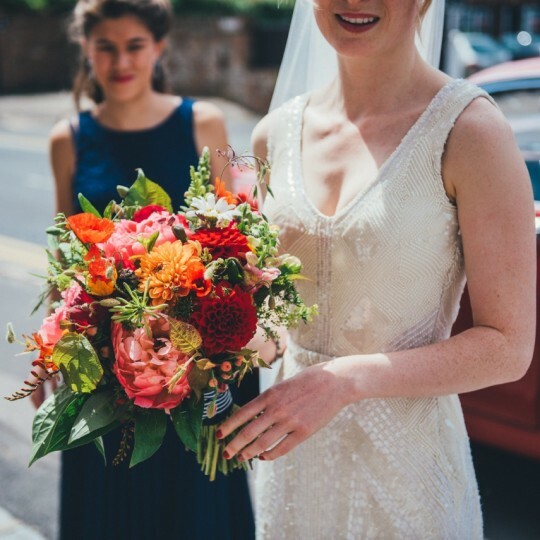 Tara chose a stunning fishtail dress and the most lovely veil with a thick border of spanish lace. Tara’s lovely daughter handing out confetti petals from her basket for guests to throw after the ceremony. In the church guests were serenaded by a gospel choir! Following the ceremony the reception was held at the Sir Charles Napier , a michelin starred Oxfordshire pub in Chinnor. At the rear of the pub is a stunning romantic terrace with a foliage covered pergola. It was such a pretty setting for the eclectic mix of guest tables . Just in case it had been covered with a gazebo but in the event it wasn’t needed as it was a stunning warm day and the whole evening took place outside. We placed random jam jars of soft peach, soft green and ivory flowers along the length of all the tables which were interspersed with the venue’s lovely ivory candlesticks. Tara’s lovely bridesmaids wore dresses of very soft green and carried posies of the soft peach tale rose and thlaspi. The stunning cake came from Hester of Sweet Tiers cakes and was her final one before a career break, a really stunning one to end on!